The West Windsor Bicycle and Pedestrian Alliance is organizing its sixth annual Walk to the Farmers’ Market to mark the opening day of the market on May 2, at 9 a.m. This free, family-friendly walk is open to people of all ages, and those in wheelchairs and strollers as well. Meet us at the back of Maurice Hawk School, 303-305 Clarksville Road at 9 a.m. Our mile-long walk will take us to Berrien Avenue on the school path, and then to Alexander Road. We then cross Alexander Road and Wallace Road and continue over the roundabout to Vaughn Drive, where we will proceed to the Farmers’ Market and the WWBPA table. If you can’t join us for the walk, you can still visit our table at the market. We’ll be there every other week starting with the first week of the market. 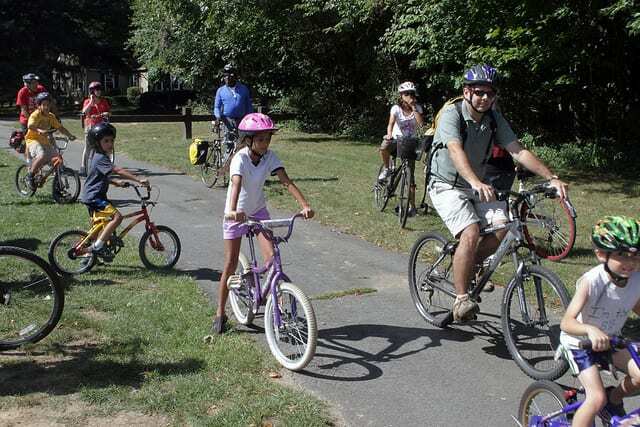 Join the West Windsor Bicycle and Pedestrian Alliance for its sixth annual Community Bike Ride on Oct. 6 (rain date Oct 7) as we head down the D&R Canal towpath to discover how it connects to other bicycling and walking routes. Our eight-mile ride will leave from Turning Basin Park (Alexander Road and the canal) and head to Brearley House in Lawrence (located on the 20-mile Lawrence Hopewell Trail). We’ll stop there for refreshments and some give-aways, plus hear about the Lawrence Hopewell Trail and the East Coast Greenway before turning back. 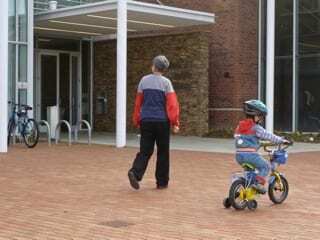 This is the last in our series of free family-friendly bike rides for 2012. Meet at the park at 2:15 p.m.; the ride leaves at 2:30 p.m. No preregistration is necessary; just bring a bike in good working order and a helmet. Children under 13 should be accompanied by an adult. This year, we are adding a walking option, from Port Mercer Canal House. Gather at the parking lot at 2:15 p.m. (departure time is 2:30 p.m.) for the 1.3-mile walk to Brearley House. 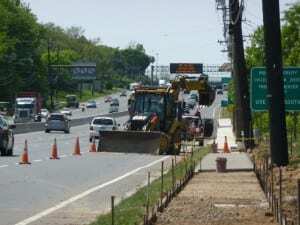 Because of road construction, the parking lot is only accessible from Route 1, not Princeton. The ride is so-sponsored by the Lawrence Hopewell Trail, Sustainable Lawrence and the Princeton Pedestrian and Bicycle Advisory Committee. 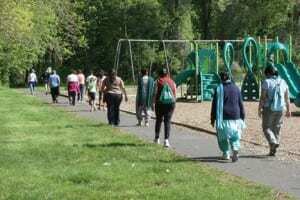 About two dozen people, many of them new faces, joined us on Sept. 15 for a five-mile loop from Community Park down the Trolley Line Trail to Penn-Lyle Road and past High School South back to the park. Thanks for coming along for the ride! The West Windsor Bicycle and Pedestrian Alliance is organizing its third annual Walk to the Farmers’ Market on Saturday May 5 to mark the opening of the market for the season. This free family-friendly walk is open to people of all ages, and those in wheelchairs and strollers as well. We will meet in the Maurice Hawk School parking lot at the back of the school, and start strolling at 9 a.m.; please arrive by 8:50 a.m. so we can leave on time. Our mile-long route will take us to Berrien Avenue on the school path, and then down Berrien to Alexander Road. We will then cross Alexander Road by the Arts Center and turn left onto the new sidewalk constructed last summer with the help of a Safe Routes to Transit grant obtained by West Windsor Township. We will cross Wallace Road and continue up over the roundabout and along more of the sidewalk along Alexander Road, including a key portion installed last year, to Vaughn Drive, where we will turn right and proceed to the Farmers’ Market. Children of all ages will be challenged by a game of “I Spy” along the way. We’ll follow a different route back to the Hawk parking lot for those who are interested. This Sunday is a 12-mile “practice walk” in preparation for the 40-mile Great Canal Walk on April 7, organized by the FreeWalkers. This walk, scheduled as a 4.5-hour walk, goes from Trenton to Princeton. They call it a casual walk to review the trail and get back into a walking groove. More information here. Saturday March 31 is the D&R Canal Watch 5K Fun Run, staring at 10 a.m. at Washington Crossing State Park. More information at www.canalwatch.org. The Great Canal Walk, from Trenton to New Brunswick, also welcomes those who want to walk just part of the route. There’s a separate five-mile walk from Upper Ferry Road to the northern end of Titusville, at the junction of River Drive and Route 29. Meet at the intersection of River Drive and Route 29 (just south of Fiddler’s Creek Road). More information at www.canalwatch.org. 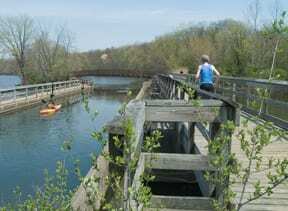 Once again, the FreeWalkers are planning a long walk along the D&R Canal towpath past West Windsor as part of their Cross-Jersey Walking Challenge. The Great Canal Walk, or TR2NB40, is a 40-mile one-day long-distance walk on April 7 that starts at the Delaware River. Do some or all of it, tracing the footsteps of this 175-year old waterway. This is a superb physical and mental challenge and the first event in a series of four walking events aiming to walk across New Jersey following the East Coast Greenway. The event is free and open to the public, and you can join at any point along the route. Two other walks are planned: the NB2MP10 – The Tween Walk on April 14, a 10-mile walk from New Brunswick to Metropark, and NJ2NY50 – The Big Walk on May 19, a one-day, 50-mile walk from Metropark to New York Penn Station. Those interested in taking the Cross-Jersey Challenge have to walk the entire 100-mile New Jersey portion of the East Coast Greenway within the next 12 months and record their efforts on crossjerseywalk.org.You don’t need to participate in any of the three walks. 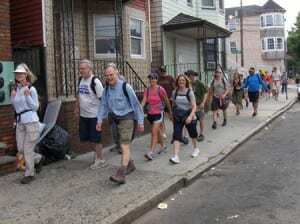 In addition, the FreeWalkers are planning a grand walk of about 30 miles all along the Hudson River on June 9. Did you know that the entire Hudson River Walkway from Jersey City to the George Washington Bridge is nearly complete and very walkable? Imagine walking all that way and across the GWB then down the Hudson River Greenway along the West Side Highway. Details will be available on freewalkers.org. The WWBPA invites doctors and other health professionals to walk with us and the public to West Windsor’s Wellness Fair on Saturday, March 31 at 1pm. Please meet at Maurice Hawk Elementary on Clarksville Road at 12:45pm for a short 10-15 minute walk to the nearby senior center. People are free to walk back individually after visiting the fair. The WWBPA promotes active living through walking and bicycling – it’s healthy, free and fun! The Wellness Fair is sponsored by West Windsor Departments of Health and Recreation, see westwindsornj.org. 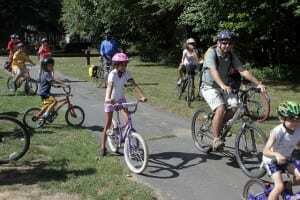 When Trenton Times columnist Mea Kaemmerlen wrote about West Windsor being designated New Jersey’s first bicycle-friendly community, she threw out a challenge to her town of Plainsboro: Catch up. We heard it, as did some Plainsboro residents. So please join us and your neighbors at 7 p.m. on Wednesday, February 1 at the Plainsboro Library to discuss your ideas for better biking and walking in the community. Where do you and your family want to ride or bike, and what would make it easier? The WWBPA wants to partner with people who live, work, or even go to school in Plainsboro. Together we’ll explore some ways to make Plainsboro a more bicycle and pedestrian friendly community. Please help us spread the word to your friends and neighbors. Hope to see you there! WZBN reporter Rose Eiklor interviewed Mayor Shing-Fu Hsueh and WWBPA President Jerry Foster and 2nd Vice President Alison Miller. The broadcast was on December 6, 2011. WZBN TV-25 is New Jersey’s Capital News Station. Maurice Hawk Elementary School Principal Denise Mengani, Assistant Principal Patricia Buell and the Hawk led students, their parents and WWBPA trustees for the Walk to Hawk event on October 18th, part of the International Walk to School month festivities. We had a beautiful sunny day for the walk. 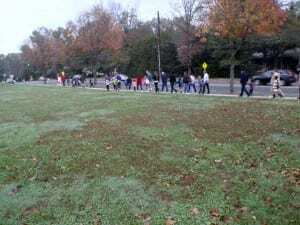 About 45 students and their parents went on the walk, which started at the West Windsor municipal center and ended at Maurice Hawk Elementary School. WWBPA trustee Stacey Karp gave each child an “I walked to school today” sticker and everyone helped make sure all the students arrived safely at school. We want to extend our thanks to the West Windsor police officers who stopped traffic at several crossings so that the group could stay together. Ms. Mengani allowed us to address the parents to we could share some of the improvements WWBPA has advocated for around town, as well as promote our upcoming events. Where would you put public benches in West Windsor? The WWBPA wants to install some benches around West Windsor. Are there any places you wish you could have a contemplative rest or ease your weary feet before walking just that bit further? Be it the Trolley Line Trail, one of our many wooded preserves, or somewhere else, we welcome your suggestions. All ideas will be discussed by the WWBPA and with other interested parties. We will keep you informed on progress. Suggestions welcomed on the style of benches too. 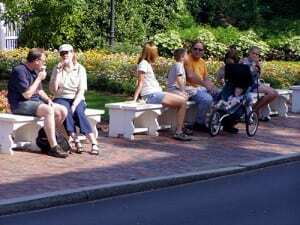 Comments Off on Benches Wanted — Where? 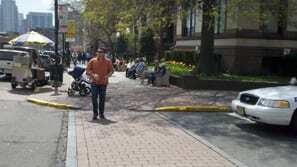 Hoboken has been named a Gold-level Walk Friendly Community! Only 11 cities received the designation, and Hoboken ranks near the top. In October we reported on Montclair and Hoboken earning Bicycle-Friendly honorable mention from the League of American Bicyclists. Hoboken’s 20 is Plenty program encourages speeds of 20 mph rather than the posted 25 mph. And there’s a citywide car-sharing program to encourage families to give up their cars. Read more about Hoboken’s innovative programs. The Pedestrian and Bicycle Information Center (PBIC), funded by the U.S. Department of Transportation Federal Highway Administration, introduced the Walk-Friendly program to encourage communities to make walking safer and to encourage families to be more active, with a goal of improving health and reducing our need for fuel. 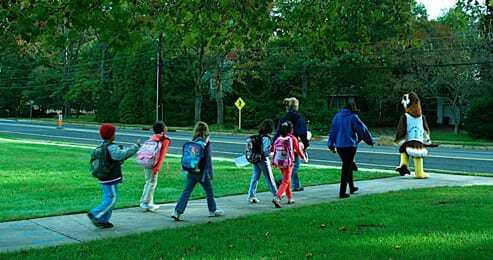 Walk Friendly Communities (WFC) is a national recognition program developed to encourage towns and cities across the U.S. to establish or recommit to a high priority for supporting safer walking environments. The WFC program recognizes communities that are working to improve a wide range of conditions related to walking, including safety, mobility, access, and comfort. 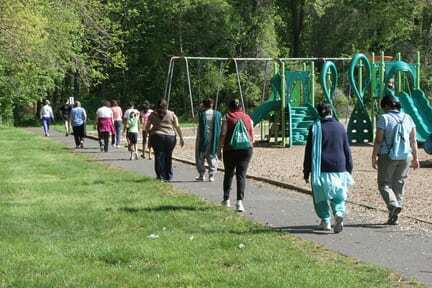 What’s your suggestion for making West Windsor more walkable? Comments Off on Congratulations, Hoboken! The WWBPA believes that building a bicycle and pedestrian friendly community benefits everyone, not just bicyclists and pedestrians. Now there’s even more proof, coming from Portland, OR. “Portland has had 6 of the past 12 years with zero bicycle fatalities. 2010 and 2008 were two of those years with zero bicycle fatalities. However, that’s only one part of a more important story. Our experience has been similar to other multi-modal cities. As cities work to make walking and bicycle riding more safe, it remains true that bicycle and pedestrian safety significantly improves. However, the greatest safety benefits are realized by people driving cars and trucks. So there you have it – building a bicycle and pedestrian friendly community not only raises property values, it creates safer streets for motorists, bicyclists and pedestrians. Everyone wins, not just bicyclists and pedestrians. The data is in! Implementing buffered bike lanes in New York City resulted in a 190% increase (nearly tripled!) in bicycling based on before and after counts. 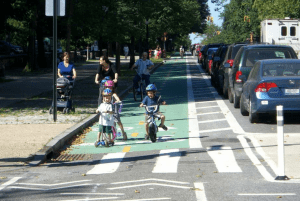 More significantly for pedestrians, the percentage of bicyclists on the sidewalk fell from 46% to 4%, and 32% of these cyclists riding in the bike lanes were children legally allowed to ride on the sidewalk! Buffered bike lanes, which are placed between the sidewalk and the on-street parked cars, are a key feature of the Princeton Junction Redeveloment Plan, although they are replaced in the Transit Village area by the Shared Space concept, which mix bicycle and motor vehicle travel lanes. According to a recent report, these dramatic results were for weekday counts between 7am-7pm. Weekend counts more than doubled (125% increase), and cyclists riding on the sidewalk fell from 20% to 4%, 43% of whom were children legally allowed to ride on the sidewalk. Want to have fewer people biking on the sidewalk? Implement buffered bike lanes – they work for bicyclists of all ages and abilities. 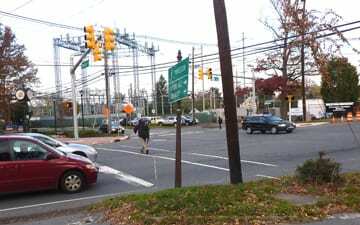 The East Coast Greenway is planning two long walks in New Jersey in 2011. On April 9, walkers will head from Trenton to New Brunswick following the East Coast Greenway, which uses the D&R Canal towpath for that stretch. Participants can walk all or part of the route, which is about 35 miles. There also will be a repeat of the 50-mile walk from Metropark to New York Penn Station on May 21. This walk, called NJ2NY50, was a huge success in 2010 and is scheduled this time for May 21st. Take part in both and you could essentially walk across New Jersey! More information will be on the East Coast Greenway’s website closer to the events. But it’s not too early to start training. Freehold residents and shop owners this month discussed a plan to make the borough’s downtown friendlier for bicyclists and pedestrians. Issues included adding a traffic signal, where to place bicycle racks, building more sidewalks, and police enforcement. There’s still some apprehension among some people about some of the ideas put forth by some consultants, and the biking and walking community may be called on again to show their support. The borough will draft its own bicycle and pedestrian plan, due for release early in 2011. Councilman John Newman also noted the need for a Complete Streets policy. Read more on the WalkBikeJersey blog. The plan presented by the consultants from Michael Baker Jr. was well thought out and clearly showed an understanding of the needs of bicyclists and pedestrians…Similar to the plan they put together for Morristown, the suggestions for Freehold also included a liberal use of bicycle lanes and sharrows on major streets where appropriate, accompanied by a reduction in motor vehicle lane width and limited elimination of on-street parking (the one street that they recommended this last action, they never observed cars parked on the street). They also suggested extending the Henry Hudson Trail further into town using the old railroad right-of-way, which is currently not used. Despite general opposition from many downtown merchants, the proposed plan does call for bicycle parking be placed in select curbside locations on Main Street, which follows the bike parking standards detailed by the Association of Pedestrian and Bicycle Professionals. However, if a curbside parking plan cannot be ratified by the Borough Council, the consultants did provide a “Plan B” bike parking proposal that would provide better parking options if bicycle parking is still not allowed along the Main Street storefronts. Probably the most unique part of the plan (and undoubtedly the coolest) was the bicycle map of the Borough that included a Bruce Springsteen bicycle tour. Freehold Borough has many historic sights due to its 300+ years of history and its close proximity to the Revolutionary War Battle of Monmouth… Still, Freehold is known the world over for being the birthplace of Bruce and there are many sights around town associated with “The Boss.” While there are eight other historic sights and places of interest in the Borough, there are nine sights uniquely associated with Springsteen and the proposed bike map points them all out. Read our previous post about Freehold. John Boyle of the WalkBikeJersey Blog analyzed the U.S. Census data from the American Community Survey for 2005-2009 (not data from Census 2010) to see how New Jerseyans get to work. Included on the blog is a spreadsheet listing all 522 New Jersey communities with the numbers and rankings for biking, walking, and taking transit. No. 39 for those who take transit (17.97%). Not surprisingly, that puts West Windsor commuters way ahead of those in the entire country who take transit (4.95%), but somewhat below those who walk (2.9%) or bike (0.5%). To see the spreadsheet for all New Jersey municipalities, go to the WalkBikeJersey Blog. West Windsor is seeking one-year extensions on state funding for a number of bicycle, pedestrian and roadway improvements, including on Village Road West from Penn Lyle Road to Edinburg Road in Dutch Neck. The project is described on the township’s website as improved visual enhancements such as high-visibility crosswalks and in-street pedestrian signage for Village Road West at the intersections with Reed Drive, Oakwood Way, and South Mill Roads. Other extensions are being sought for projects on Village Road West from about St. David’s Church to North Post Road; Wallace Road from Alexander Road to Route 571 (by the train station); the South Post Road bikeway from Village Road to the rowing center; and the next phase of the Penn Lyle Road improvements, which involves widening the road between Clarksville Road and Canoe Brook Drive. Bob Hary, the township’s business administrator, said the intent is to put all the projects out for bid in the spring. He said at Monday’s council meeting that the extension is needed because the funding didn’t coincide with the township’s capital improvement plans. The National Center for Safe Routes to School awarded Philadelphia’s South of South Neighborhood Association (SOSNA) Pedestrian Advisory Committee and the Universal Institute Charter School (UICS) one of its 2010 mini-grants to encourage safe walking and bicycling to school. 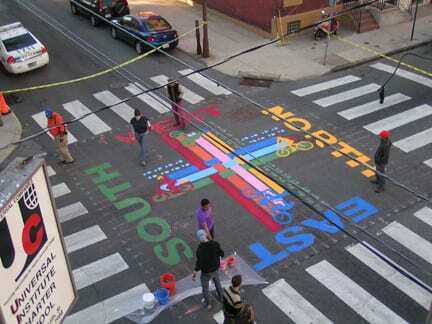 Students and neighbors from SOSNA and UICS painted an intersection mural, “a low-cost way to alert and inform motorists of the school zone,” at 15th and Catharine Streets. Leading up to the painting project, members of Safe Routes Philly taught bicycle safety to 5th and 6th graders in UICS. 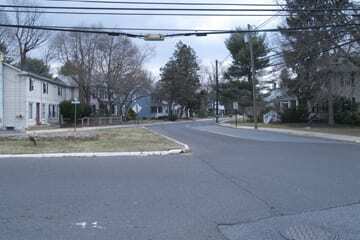 Let us know if you have a creative idea for safe routes in West Windsor. 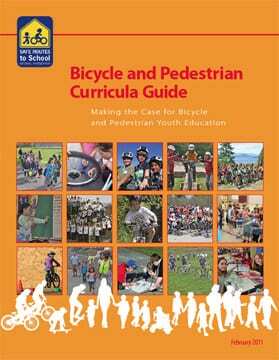 Guidelines for mini-grants are listed on the Safe Routes website.